Thirteen more bodies have been retrieved from the Gloria Coal Mine in Middelburg, Mpumalanga. More than 20 bodies were reported to be trapped underground following a gas explosion that took place two weeks ago. An unknown number of people are still unaccounted for. It is alleged that the group went underground to steal copper cables. Mpumalanga Police Spokesperson Leonard Hlathi says a total of 18 bodies have now been retrieved from underground so far. 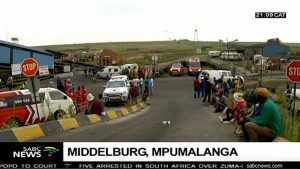 The post Thirteen bodies retrieved from Gloria Coal Mine appeared first on SABC News – Breaking news, special reports, world, business, sport coverage of all South African current events. Africa's news leader..